Discussion in 'Birds' started by kramp, May 24, 2005. At first the Flickers were very shy, any movement through the window and they were gone, but now if the suet feeder runs empty I get the look. 300 f4 afs 1/200@f4 touch of flash, hand held through the window. that's nice...i like the reflection. Nice shot, Martin! He does seem to have a frustrated look on his face. Thanks for the comments Leigh, Don and frank, much appreciated. 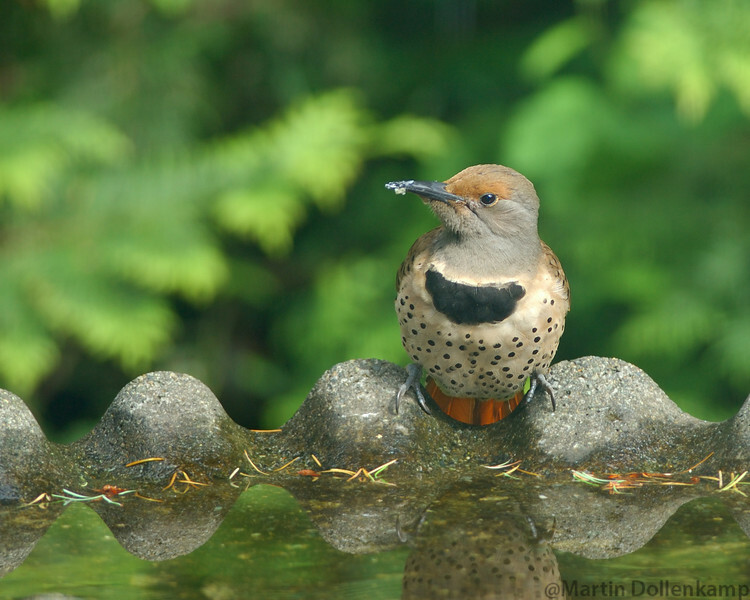 Hey Martin, Flickers are very handsome birds, I only wish I was able to see more than just a couple a year around my homestead. Good capture. Nice shot. good focus and color. Hi Pete, the flickers have been coming very regularly all winter, hard to get a good picture of them though. Thanks Greg, not bad for through the window. cool shot Martin, like the reflection and his pose!!! quite the back yard!! Thanks Sandi, it took a few tries to capture her snippy look. Nice shot Martin. I see one flying around our neighbourhood, but he won't stay still for very long and he's usually on a rooftop which doesn't make for a very interesting shot. Maybe I should put in a bird bath. Here in sunny Kamloops it would be a big attraction I think. Thanks Dennis, I spent months spoiling them with suet and peanut butter cake that I make, its taken a long time for them to get used to us. Beautiful Bird and Beautiful shot. Nice shot of the female. I find the males to be just a bit tougher to approach. BTW, where do you live on the Island? I am in Nanaimo. Thanks Rory, I am up in Black Creek just down the road from Miracle Beach Park. Bryan and Gale, thanks for the comments!